Germany vs Serbia betting tips – The confrontation takes place at Wolfsburg on the Volkswagen Arena. I have two bands that have participated in the World Championships last summer, so I expect a very interesting duel. 1. Statistical data to be taken into account before playing Germany vs Serbia betting tips! He has only one win in the last 4 matches, and in 2 of them he was defeated. On his own home is unbeaten by 4 games and in 2 he managed to impose himself. In 4 of the previous 5 duels scored and only in one did not get the goal. He finished last in Group 1 of the League of Nations, under the Netherlands and France. Consequently, she relegated to the League B of this competition. In the last 6 games he has not lost and confused himself only twice. He comes after 3 games in which he scored good results, 2 wins and a draw. He scored in 5 of the previous 6 disputes and in 3 he did not even score a goal. In the League of Nations he won the 4th group from which Romania was also part. He will play in League B at the next edition of this competition. 2. Latest information before Germany vs Serbia! Joachim Low announced he will no longer count on Hummels, Boateng, and Muller. Klosterman, Stark and Eggestein were summoned for the first time at the big national team. Neuer, Kroos and Ginter are the only world champions to be the 23rd. Nikola Vasiljevic and Miroslav Bogosavac are at the first call. Tadic, Matic, Kolarov and Milinkovic-Savic do not miss the 23 players. Marko Grujic is one of the notable absences, according to footballexpert.com. 3. Germany vs Serbia teams likely! Germany (4-2-3-1): Neuer – Kehrer, Sule, Rudiger, Schulz – Gundogan, Kroos – Gnabry, Reus, Sane – Werner. 4. Germany vs Serbia latest last meeting info! The two selections were the last time in 2010. 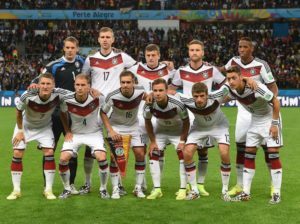 Germany is the stronger team with a lot more valuable in my opinion. She will evolve on her own ground and will have many supporters on her side. “Panzerele” have been confused with Holland only in the last three home games. It is important to know that they managed 2-0 by the 85th minute in the Batavian duel. Serbia lost to the World Championship with Switzerland and Brazil, troops in Germany. She has a few older players, and that could count, the program being crowded. It’s hard to believe there will be many goals because both bands have strong defenses.